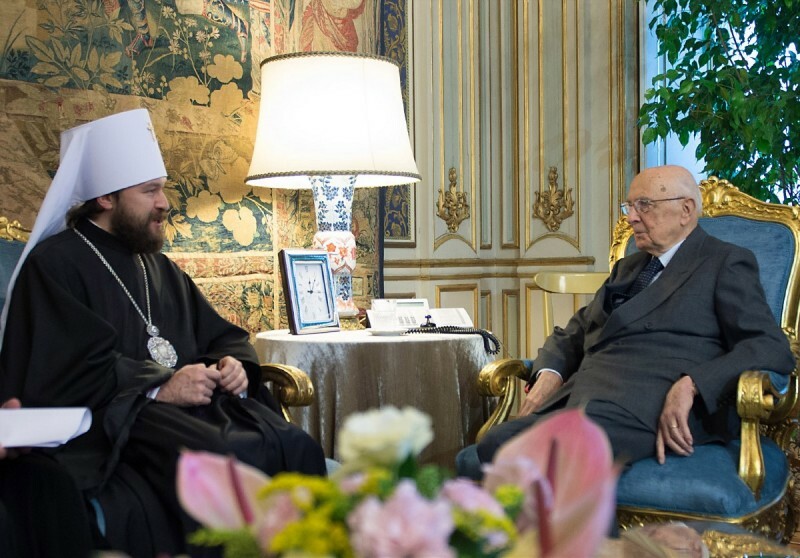 On 12 November 2013, Metropolitan Hilarion met with the President of the Italian Republic, Mr. Giorgio Napolitano. They were joined in the meeting, which took place at Palazzo del Quirinale, by counselors to the President, Antonio Zanardi Landi and Carlo Guelfi, deputy minister of foreign affairs, Marta Dassù; Russian Ambassador to Italy, Sergei Razov; archimandrite Antony (Sevryuk); hieromonk Giovanni Guaita and Rev. Alexei Dikarev, staff members of the DECR. Metropolitan Hilarion conveyed to President Napolitano greetings from His Holiness Patriarch Kirill and noted the great importance of the President’s work under the difficult conditions of economic and political crisis in Italy. President Napolitano underscored the importance of dialogue among believers and non-believers carried out in the framework of the “Courtyard of the Gentiles’ project initiated by Cardinal Gianfranco Ravasi, president of the Pontifical Council for Culture. The President also noted Pope Francis’ openness to the dialogue with secular society, Christian Churches, and followers of other religions. Metropolitan Hilarion told President Napolitano about his visit to Lebanon and the difficult situation of Christians in the Middle East. Christian politicians in Lebanon and heads of different Churches in the country told the Metropolitan with great anxiety about the tragedy of Christians who have to leave the Middle East, the cradle of Christianity, because of armed conflicts and terrorism. They think that they have been left to their fate by the Western countries and are in terror of their future. Metropolitan Hilarion asked President Napolitano to make moves towards the protection of Christians in the region. It is necessary to implement the principle of the European Parliament resolution of 2011 to provide security and protection to religious denominations, including Christians. President Napolitano agreed that European countries should do more for the protection of the persecuted Christians. The DEC chairman expressed his concern about manifestations of Christianophobia in European secular society which renounces its Christian roots and the system of values on which the European culture is based. For instance, the denial of Christian notion of the family is leading to the demographic disaster and means the suicide of the European nations. President Napolitano noted the low birth-rate in Italy and the demographic crisis in the country. He underscored that at the same time the traditional family still plays a very important part in Italy. He admitted that though the European Union is based on the values of Christian origin, the European countries are experiencing difficulties in preserving these values and in passing them on to the next generations. In this regard, the educational mission of Christian Churches is especially important. Metropolitan Hilarion expressed his satisfaction with constructive relations between the Administration of the Moscow Patriarchate parishes in Italy and the Italian Republic, which renders necessary assistance in arranging parish life of the Russian Orthodox believers.